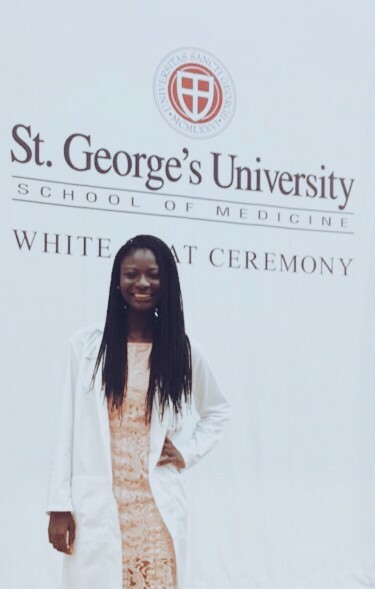 Jesam Usani at her White Coat Ceremony for St. George’s University School of Medicine, January 26th, 2018. The Hundred Year Association recognizes and awards college scholars who have excelled academically and contributed to their communities. Jesam Usani was a recipient of the E.Virgil Conway College Scholarship Award in 2015. Just three years later, she is on her way to becoming a doctor. Usani reached out recently and thanked the Hundred Year’s scholarship program for the important role it played in helping her reach her goals. What has inspired you to continue your path in health and medicine? My initial fascination with medicine started with having an epileptic sister in addition to having a mother who was a nurse in Nigeria. My mother cared for people beyond the scopes of her job. She went to the aid of so many people in need despite their ability to compensate her. Growing up around that kind of compassion ignited a love for humanity that I sought to bring to fruition by being a healthcare provider. In recent years, my curiosity for medicine has led me to pursue internships in the medical field to work alongside doctors. Seeing their journey with their patients from sickness to well-being has continued to keep that fire ignited in me. Will you be specializing in a specific field in medicine? I plan on specializing in neurology. My sister’s condition initiated my interest in neurology and the more I explored the field, the more interested and fascinated I became with it. Since then I have had neurology oriented internships that have solidified my interest to pursue the field. Instead of the typical, “where do you see yourself in five years” question – How would you describe this milestone in your life five years from now? Five years from now when I look at this point in my life, I have no doubt that I would be grateful. It is such a great opportunity to be accepted to study medicine. So far it has been the hardest thing that I have had to do career-wise. Five years from now I know I am going to be very appreciative of this time in my life, one that made me a better and more resilient person. How do you think it would have framed your next steps? Just as my mother gave back to the community that we lived in. I am a strong believer in giving back to people who are less fortunate. My favorite quote is, “To whom much is given, much is expected.” Becoming a physician will allow me to go to remote areas of the world and provide health care to people otherwise overlooked. I believe my sister’s condition would not have been as severe as it is currently if there were an availability of specialized physicians willing to work in underserved communities. As a future physician, I aspire to be the kind of doctor that prioritizes a patient’s well-being regardless of the ability to pay. How would you have grown from the experience? I would definitely be more knowledgeable about the human body, disease and what course of treatment to take. Today I had my white coat ceremony, the common theme among the speakers was their emphasis on the fact that we, as medical students are beginning a journey that at the end, would allow actual human lives to be entrusted to us. In that moment I realized at the end of my medical education I would grow tremendously because of my responsibility to care of patients. What is one word you would use to describe yourself now and one word you would use to describe the end of your journey? Currently, I would describe myself as expectant. I am eager to see where my graduate school education takes me. From the age of 12, I knew I wanted to be a doctor. This is the first stage of my medical career and it is very exciting. At the end of my career, I believe I would describe myself as fulfilled because I would have completed a very rigorous program. Outside of school and work what do you enjoy doing? I enjoy being outdoors. I really love running, it is a great stress reliever and I love hiking. What is your natural superpower? I would say my natural superpower is my friendliness. I have been fortunate enough to be able to make friends with anyone I meet. I have been told that people find my smile welcoming. How do you think your superpower will help others? I believe my natural superpower is perfect for the career path I am pursuing. My entire career is going to revolve around meeting and caring for people. My ability to make them feel welcomed and comfortable in times of crisis is going to be essential. Usani is set to graduate from St. George’s University School of Medicine in 2022. To read more about the E.Virgil Conway College Scholarship Award program click here.